New mall: Part of South Nedderman Drive east of Cooper Street will be used for a pedestrian mall in front of the future Science and Engineering Innovation and Research Building. South Nedderman Drive has closed permanently between Cooper Street and Planetarium Drive. The space will become part of an open mall near the Science and Engineering Innovation and Research building, which will break ground later this year. For news on parking lot expansions, lot striping and resurfacing, and other parking-related projects, go to uta.edu/progress. And Have Your Say to share your thoughts, cheers, and suggestions about UTA’s growth. For routine construction and maintenance news, read the Blazing Construction blog. The University events calendar will receive a long-awaited and much-needed makeover this summer. University Communications will upgrade UTA’s event calendar to a cloud-based system on Tuesday, June 28. The new calendar brings an array of features including a fresh, modern, mobile-friendly interface, social media integration, personalized calendar views, embedded maps, and more. Preview the new calendar and its features by visiting the introductory page. Please direct any questions or concerns to Daniel Evilsizor, director of online communications, at daniel.e@uta.edu. Four parking areas will be used on game days when the Dallas Wings play at College Park Center. Upcoming games are Thursday, June 16; Tuesday, June 21; Thursday, June 23; Saturday, June 25; and Saturday, July 2. Read more. 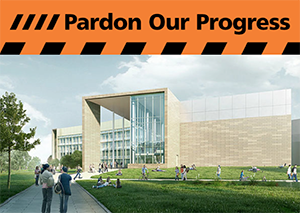 To facilitate a construction project at Carlisle Hall, fencing and scaffolding has been installed around the perimeter of the building and the current pedestrian pathways have been closed between Carlisle Hall, Preston Hall, and Ransom Hall for 30-60 days. Signs will be placed around the area to identify the modified pathways. For questions or concerns, contact Nick Myers at nmyers@uta.edu or Don Lange at donlange@uta.edu. 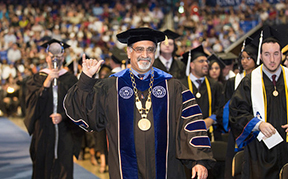 Read the latest comments by President Vistasp Karbhari in Mav Milestones on Commencement and a presentation with Mansfield schools. The third candidate for dean of the College of Education will have a session open to the University community at 2:30 p.m. today, Tuesday, June 14, in Room 204 of the CAPPA Building. Janina Brutt-Griffler is a professor and chair of the Department of Education Leadership and Policy at the State University of New York at Buffalo. She also is director of the Research Center for Comparative and Global Studies in Education in the Graduate School of Education in the College of Arts and Sciences. She earned her bachelor's, master's, and doctoral degrees from Ohio State University. The online survey for Dr. Brutt-Griffler ends at noon Wednesday, June 15. Visit the Senior Leadership Searches webpage to learn more about the dean search for the College of Education as details become available. The Innovation, Diversity, Excellence, Access, and Success (IDEAS) Center offers mentoring and drop-in tutoring in the Academic Plaza on the second floor of the Central Library. The center will provide centralized and flexible services to high-need students to support their transition to the University. 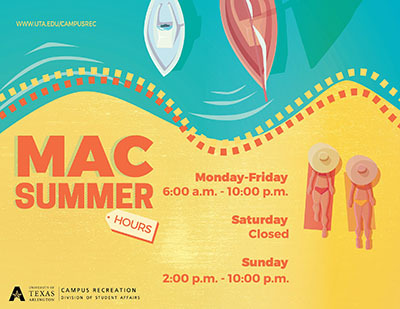 IDEAS Center hours are 2-5 p.m. Mondays; 10 a.m.-1 p.m. Tuesdays; 3-6 p.m. Wednesdays; 2-5 p.m. Thursdays; 10 a.m.-2:30 p.m. Fridays; and 11 a.m.-2 p.m. Saturdays. Students can share their social, personal, and academic inquiries with peer mentors who will share their UTA experiences and direct them to on-campus resources. A new roofing system will be installed on Hammond Hall beginning Monday, June 20. The roof should be complete by Monday, July 10, but could be delayed because of weather conditions. 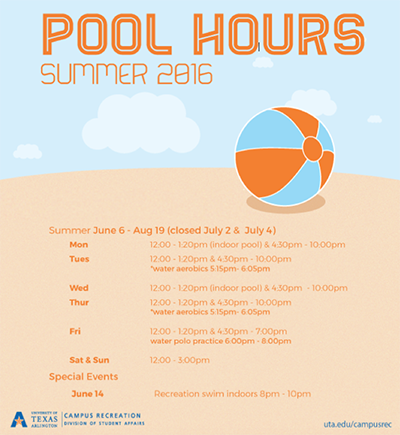 For questions or concerns, e-mail Jeff Johnson at jljohnson@uta.edu. The FBI recently issued an advisory on increased complaints for technical support scams. The scammer claims to be an employee of a major computer software, security, cable, or internet company offering technical support to the victim. The scammer will try to get the victim to give remote access to the computer or financial accounts to pay fees for removing viruses from the victim’s computer. Read more on how to protect your computer and accounts. 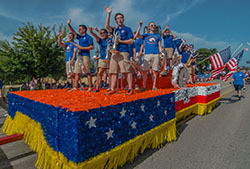 Members of the UTA community are invited to cheer on the University’s two floats in the annual Arlington 4th of July Parade in the College Park District. The parade begins at 9 a.m. Monday, July 4. Free public parking will be available in campus parking lots and College Park garages. Parking lots and garages will open at 6 a.m. The UTA Police Department seeks your opinion regarding its performance in serving the community. Take the survey through Thursday, June 30, to give your input to enhance UTA PD's professionalism and the services provided to faculty, staff, students, and visitors. Share your opinions with UTA Libraries in a simple, anonymous, and confidential survey. Complete the survey. Questions or comments? Email utalibqual@listserv.uta.edu. To claim discounted tickets for select Texas Rangers' home games, visit texasrangers.com/grouptickets, click on the University of Texas at Arlington, and use the password GOMAVS. Cast your vote for Anne Bavier, dean for the College of Nursing and Health Innovation, as one of the 100 most influential people in health care. Modern Healthcare magazine has placed a list of 300 people, including Dr. Bavier, on an online ballot. Voting takes only a few seconds. Go to the Modern Healthcare site, scroll down to Anne Bavier (names are listed alphabetically by last name), and vote. Then continue scrolling to the bottom, click Next, and scroll to the bottom of the second page and click Next. On the last page, click Done. Anyone can vote through Friday, June 24, so encourage your family and friends to participate. Census date for summer 11-week session. Last day to drop classes for summer I session; submit requests to adviser prior to 4 p.m.
Last day of classes for summer I session. Final exams for summer I session. Registration is continuing for the second summer session and fall 2016. Advising is available in your academic department. The MyMav schedule of classes is being updated daily. Plan to validate your course selections closer to the start of the sesssion. 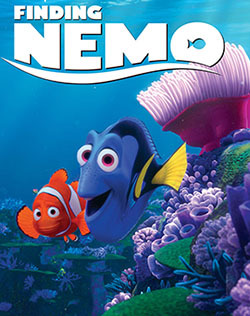 Bring a chair or a blanket, a picnic, and friends for outdoor movies each Thursday on the west lawn behind the Maverick Activities Center. Enjoy free popcorn courtesy of EXCEL Campus Activities. Dallas Wings Dallas Wings vs. Seattle Storm. Tickets $15-$50. 7:30 p.m., College Park Center. Also, 7 p.m. Tuesday, June 21, vs. Phoenix Mercury; 7:30 p.m. Thursday, June 23, vs. San Antonio Stars; 7:30 p.m. Saturday, June 25, vs. Indiana Fever; and 7:30 p.m. Saturday, July 2, vs. Connecticut Sun. All at College Park Center. Native-American All-Star Football Classic UTA hosts games sponsored by Native Re-vision, a 501c3 non-profit organization that utilizes competitive sport to support and challenge Native American student-athletes. Tickets and details at nativerevision.org. Maverick Stadium. UTA Libraries: 'Building a Barrier-Free Campus' Explore how UTA began to become a model accessible campus for students with disabilities. Sixth floor parlor, Central Library. Through Sept. 16. UTA Libraries, History, College of Liberal Arts’ Festival of Global Ideas, Office for Students with Disabilities. UTARI Lunch and Learn Robert Taylor, professor of mechanical and aerospace engineering, "Physics-First Design for Advanced Manufacture of Structural Components." Register online. Shuttle available. Lunch provided. Noon, UTA Research Institute, 7300 Jack Newell Blvd. S., Fort Worth. UTA Research Institute. Career Development Job search assistance including résumé reviews and interview and networking tips; employer events, such as information sessions and on-campus interviews; and career development assistance are provided. Upcoming events are on the website. Call 817-272-2932 for an appointment. Career Development Center. Upcoming intramural sport deadlines are softball, June 15; sand volleyball and racquetball, June 22; billiards, June 30; badminton, July 12; basketball, July 13; poker, July 21; and MavStrong, Aug. 11.